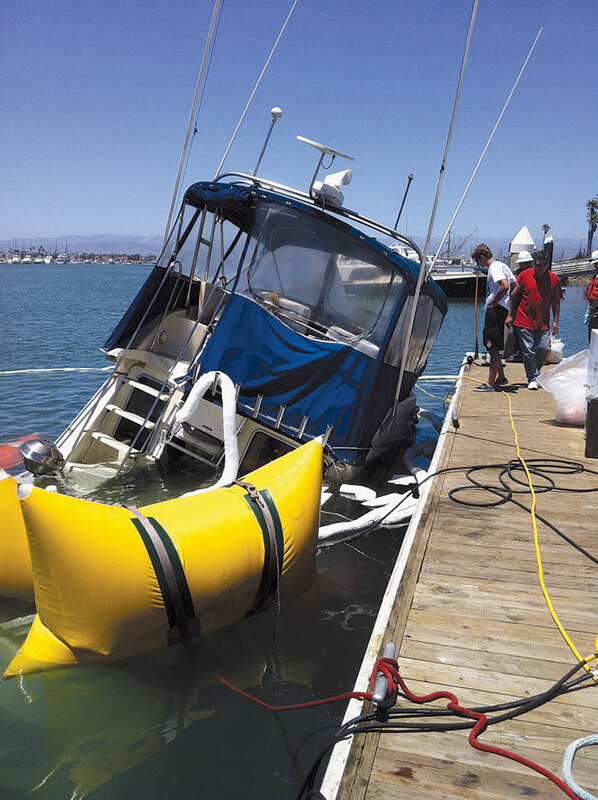 CHANNEL ISLANDS HARBOR — According to Channel Islands Harbor Patrol officers, a 36-foot powerboat collided with a detached breakwater at 4:50 a.m. June 26, while attempting to leave the harbor. After the impact, the boat’s operator was able to return to the harbor and make way to the harbor administration dock, where the boat promptly sank. When asked about where he hit the breakwater, the boater was unable to say. Harbor patrol officers inspected the structure and could not locate any area showing damage, hull paint or any sign of contact. “He did not call our office (Harbor Patrol) for assistance, but he did return to the harbor and made it to the harbormaster’s dock at 0450 hours,” Peveler said. “Patrol Officer Bittmann was under way in the harbor when she observed the vessel at our dock, and could see that it was obviously taking on water,” Peveler said. By the time Bittmann was able to ready a dewatering pump, the vessel sank at the harbor administration dock, Peveler reported. “The patrol officer contacted the Ventura County Sheriff’s office to conduct a field sobriety test on the vessel’s operator,” Peveler said. The operator was cited on boating under the influence charges, Peveler said, adding that the boater has previous convictions for this offense. “We will be cooperating with local and state agencies to pursue this issue,” Peveler said. On-duty Harbor Patrol officers Bittmann, Hrabak and Werner immediately implemented pollution containment measures, putting a boom in place and working to soak up oil with pads. Peveler estimated that the vessel had about 300 gallons of diesel fuel on board when it sank. Vessel Assist personnel raised the vessel and towed it to a local boatyard at approximately 4 p.m. According to harbor director Lyn Krieger, the California Department of Fish and Game, the Coast Guard, and other agencies responded immediately to the scene and were of great assistance to the patrol officers.